short girl, long island. : Life After Death. A few times on the blog, I mentioned how I was reading Life After Death, written by Damien Echols, a man wrongfully imprisoned for eighteen years for a crime he did not commit. I finally finished the book on Sunday afternoon, and had to sit down to write down all that was swirling through my head. 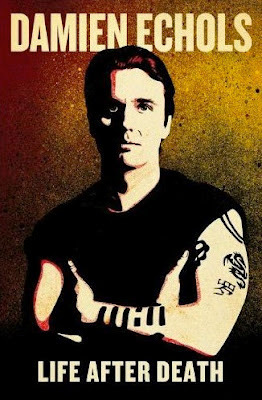 I first heard of Damien Echols when I saw the documentary, Paradise Lost. He, along with Jason Baldwin + Jessie Misskelley, were accused of murdering three children. I remember watching it really late at night in the basement at my Aunt Lil + Uncle Marc's house - I believe it was the summer after eighth grade. I was flabbergasted at how these individuals, teens expressing themselves through their attire + music, had been pegged for these murders. I remember wearing questionable clothing [it covered my body, don't fret] + listening to Marilyn Manson. My mom would say that Manson was not a good influence - she even blocked MTV from being viewed at her home, because of questionable content [aka Beavis + Butthead]. I would get so frustrated with her reasoning, but being an angst-ridden teen who was attempting to cope with the recent death of her grandfather, I did not handle it with grace. I wanted to write these boys, who were a few years older than me, to tell them that I believed they were innocent. To say that I, too, have been misunderstood + called a weirdo, because of how I dressed + what I listened to. But I never wanted to bother them. I figured they received loads of letters from people, stating that they were on their side. Who would want to hear from a thirteen year old kid, anyway? Over the years, I randomly thought about the gentlemen + would hop on Google to see what was going on with the case [I even wanted to order them books from their Amazon wish lists, but I was afraid the guards wouldn't deliver the parcels]. Eventually, they were released in 2011, with a plea deal that was less than stellar, but to get off of death row - I would have probably done the same thing. When I heard about the West of Memphis documentary, I also caught wind of Damien's memoir, Life After Death. Luckily, I was able to snag an advance copy so I could tell my readers about it. I don't even know where to start, folks. There is so much that I learned while reading this book. After spending over half of his life on death row, the fact that he made it out intact truly amazes me. He is a fascinating person, someone I could see myself randomly chatting with in a coffee shop about the weather, a book, or music. Not fascinating in a negative sense, or in some freak-show sort of way - I want to clarify that. When you read the text, you will understand what I am getting at, without revealing the contents of the book. I also have such a great respect for Damien's wife, Lorri. My god, what a wonderful + strong woman she is. I can't begin to imagine what the both of them went through [pieces are given through the book, but there is only so much you can put in a book just shy of four hundred pages], but I am so glad they had each other. That's the power of love [yes, that is a Huey Lewis + The News quote, plus my second BTTF reference this week, but hey - it works]. In all seriousness, this book brought out a variety of emotions, as Echols has a way with words + connects with readers on a level I didn't think that was possible. I am kicking myself for never sending letters of support, after reading what Damien experienced throughout the course of his life. Luckily, he received continued support over the years from notable folks such as Peter Jackson, Johnny Depp, Eddie Vedder + Henry Rollins, just to name a few. These people helped shed light onto the case + made sure this wasn't forgotten, that these men would be freed. Life After Death will be released on Tuesday, September 18. If you'd like to pre-order or purchase for your Kindle, head over to Amazon. If you are going to be in the NYC area on Friday, September 21, there will be a speaking engagement of sorts with Damien Echols + Johnny Depp at the Union Square store. If I didn't have to work that day, I would be there in a heartbeat. If any of you attend the event, please let me know how it went! Wow, I hadn't heard of this case, or this person. But it definitely sounds like something I'd be into. Adding the book to my TBR list now! By the way, I nominated you for The Versatile Blogger Award!